Team University of Gerona at the euRathlon 2014 Sea Competition. ©euRathlon. euRathlon is an outdoor robotics competition focused on realistic emergency-response scenarios inspired by the 2011 Fukushima accident. After a successful land-based competition in 2013, a marine-based competition takes place this year in La Spezia, Italy (29 Sept – 3 Oct). 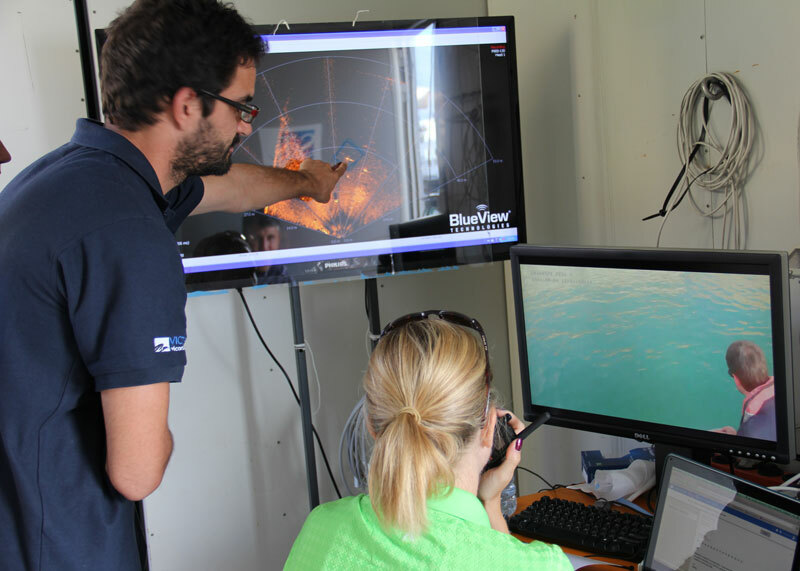 The good weather present in the first two days of euRathlon 2014 helped the teams participating in the “Long range autonomous underwater navigation” and the “Leak localisation and structure inspection” scenarios. Only two of the six teams participating in the first scenario successfully finished it, while all the teams participating in the second scenario completed it. The scenario took place in a coastal water area free of boats and other floating obstacles. The Autonomous Underwater Vehicles (AUVs) were deployed at the starting point. They had to navigate underwater a distance of 900 meters drawing a quadrilateral shape, which was marked by four waypoints. The waypoints were GPS coordinates given by the organization to the teams. The robots had to surface when reaching each of the waypoints. Teams had a maximum of 70 minutes to complete this scenario, and the task was complete when each team’s robot returned to the starting point. The judges on the boat and inside the sonar cabin evaluated in real time the performance of the teams. Once the scenario finished, maps with the trajectories of the vehicles were created from the data given by the teams. 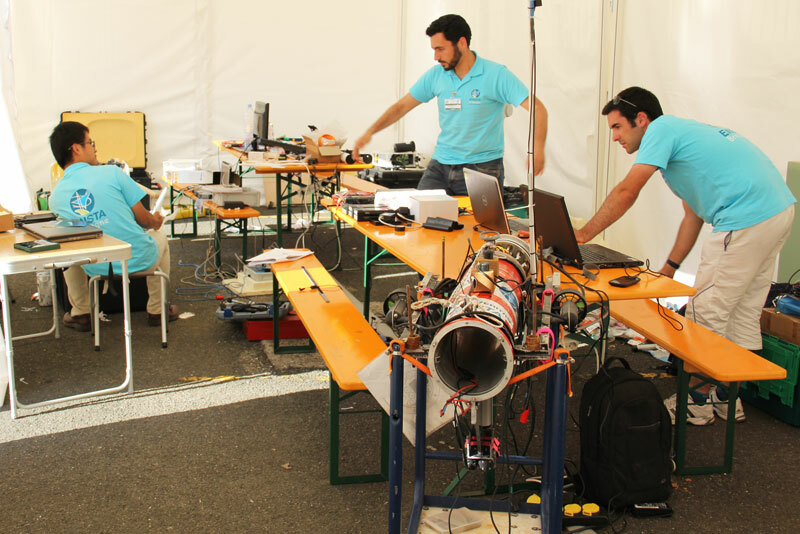 On Monday morning two teams decided to withdraw from this scenario due to technical problems, leaving four participating teams: University of Girona, Robdos, SAUC’ISSE and Avalon. The team from the University of Girona and the team SAUC’ISSE gave a very good performance. 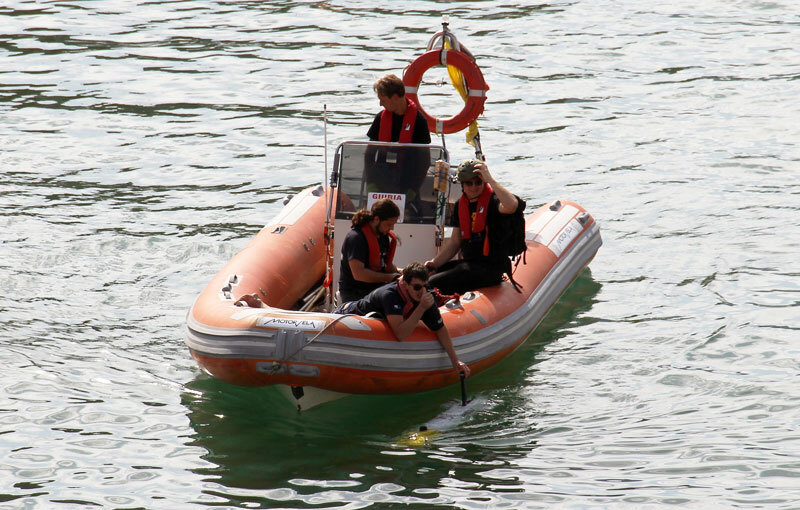 The French team showed the cooperation between an Unmanned Surface Vehicle (USV) and an AUV. Teams had a maximum of 70 minutes to complete this scenario, and the task was completed when the robot returned to the starting waypoint. Team SAUC’ISSE competing at the euRathlon 2014 Sea Competition. ©euRathlon. In the second scenario the robots had to find an underwater piping assembly that was leaking contaminated water. The leak was represented by a plume of Objects of Potential Interest (OPI), in this case white and orange buoys with numbers written on them. Once the robots found the structure, they had to inspect it and localise a stopcock. Teams had a maximum 60 minutes to complete this scenario. This scenario was held on Tuesday in a sheltered harbour. The teams participating were: CISSAU, University of Girona, SAUC’ISSE and Avalon. All the teams completed the scenario, and gave their data logs to the judges. The judges have yet to analyse the data and decide which teams performed best. A judge evaluates Team University of Girona at the euRathlon Sea Competition. ©euRathlon. There are still three more days of competition to come: Wednesday 1 October “Interaction with underwater structures”, Thursday, 2 October “Environmental survey of the accident area” and Friday, 3 October a “Combined scenario”. If you want to know more about the euRathlon 2014 scenarios and the teams’ performance, follow the competition on twitter and Facebook for daily updates. Winners of the euRathlon 2013 land robotics competition announced!